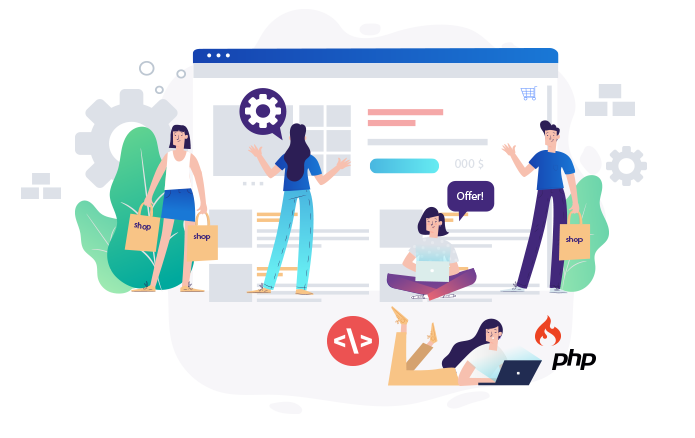 Grab exceptional, robust and tacitful eCommerce development solution with Codeigniter framework with Fully advanced PHP 7.x ready systems. Gain confidence with the UI/ UX on product development, design, support and extension. Analyze allround aspect of the clients’ concept, with a clear perspective over client requirement and facilitating solutions for each of them. Set out a structured methodology to plan the high level features of project with a strategy that facilitates robust architecture within the client’s resources and agenda. An outline of a web page that propose a visual understanding in an architectural design which portray navigations, buttons, columns and more for clients. Propose a high reliability visual depiction of clients project, which demonstrates how the product seem to be with connecting buttons, landing pages, menus and more. Web designs and applications for clients are designed by the designers more carefully and perfectly by pouring into all their creativity. Systematic development of each of the phases and get into a certain estimate of the process with logical accuracy. Deliver the project on exact time as committed to the clients and based on the original plans, responsibilities without compromising over the quality of the application. Client support and maintenance is the key towards progress of any business. We understand that and we are keen to support our client 100% towards this direction. Commerce solutions that offer a clean scope to the client and help them amplify their business are certainly the next step that everyone would want to move in. We integrate assembling information, Self- Service activities, update sales details, generate financial statements in ERP based on web transactions for clients. Optimizing user flow to navigation, across devices and on the pages that will create an easy and extraordinary experience for the clients. Get a well structured CMS built just for everyone's business necessity. Get a flexible solution and extend the scope as it demands on the go. Professional On-Project support and Post-Delivery maintenance are offered as a part of Codeigniter development activity. We pledge to clients on providing more rapid service and solution. Skilled developers craft easier solution on to migrate the cart from any platform to codeigniter which offers ease of operation and flexibility. Integrations with third party API's, Themes, CRMs, and other collaboration tools to accomplish clients desires. Developer fabricate websites rapidly with widespread set of libraries by building up light and extremely impactful solutions for the clients. Wider web backend for mobile apps with CodeIgniter technology and cost efficiency for customers to get a robouts on mobile applications. Proficient with the latest version of PHP and its configurations. Implement professionally special trends for hassle free implementation of applications.